A few weeks ago, I attended my first trade show on behalf of a client in three years. It was a rather large trade show and I was tasked with social media strategy and execution during and after the show. I’ve always found trade shows to be fun–pure adrenaline and exciting for me, as a solo, to work with people for a few days–but yet challenging considering the days are usually long (9-12 hours, usually) and devoid of solid food and beverage choices (lots of water is my mantra). But, for many brands, trade shows are still content goldmines. 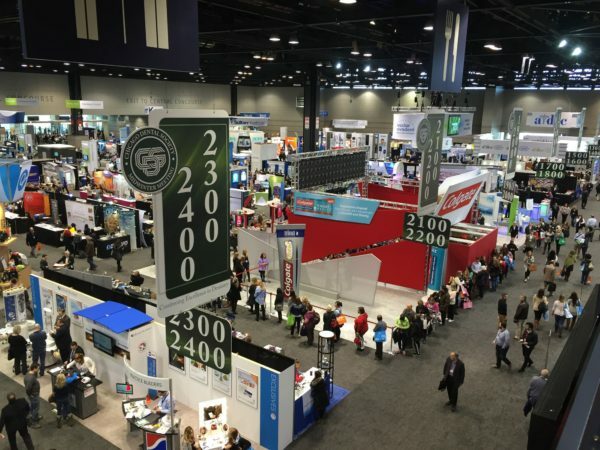 Your customers are at trade shows. Thought leaders are at trade shows. Media are at trade shows. And, influencers are sometimes at trade shows. These all represent significant content opportunities for brands in different ways. Show-specific (engaging with the show sponsor’s Twitter account, for example, or talking about sessions at the show). The formats range from video (heavy on interviews) to text/photo to more interactive (Facebook 360 pics, gifs of you walking the show floor, that kind of thing). Usually, our approach is to capture a ton of content at the show, share some of it during the show, and save much of it for after the show to share over the course of the next 2-3 weeks (if not more). During the show is pretty straight-forward–it’s a mix of sharing via Twitter (for real-time, hashtag following, tweeting more often here), Facebook (with paid support, of course, far less often than Twitter), Instagram (quite often, depending on the show) and LinkedIn (a post a day at absolute most). This is where you can talk all about those tech trends you saw at the show–including your new product! This is also a prime spot to incorporate interactive content you captured at the show–embeds of 360 pics on Facebook, video interviews and gifs of you walking the trade show floor work well here. All those video interviews you captured of customers at the show? They’re great assets to share with your sales team as they approach customers in the coming months. In fact, you could create short email templates/language for your sales reps to use that include links to your video interviews on YouTube or Vimeo. Remember all those customer leads (email addresses) you got at the show? Why not follow-up with them in a couple weeks with an email that includes many of the content assets you grabbed at the show including customer interviews and the wrap up blog post above? Great way to show added value without asking for a sale (save that for the NEXT email!). Those video customer interviews are great content assets to add to any product landing page. They add instant credibility, and for many landing pages, they may be the only video assets you have on the page. Recapping the show is easy on Twitter now with Twitter Moments. Just grab your very best tweets (a mix of interactive content works best, in my opinion), a few customer tweets, and other tweets from the trade show organizer (the welcome and closing tweets to the show are good) to partner orgs or vendors at the show to put together your Moment. Those video customer interviews from the show that you shared DURING the show–yeah, you can use them again! They probably don’t have an uber-long shelf life, but you should definitely use them a few weeks after the show again to max out on exposure and use. And finally, all these content assets we’ve been discussing make for great content to share via employee e-newsletters, intranets and other internal communications. Ideally, you’d want to tether these communications fairly close to the end of the show though. Kinda like a “take a peek at what our team was up to last week at CES in Las Vegas”-type thing.